You’ve been lied to. Documents obtained via the Freedom Of Information Act by the Electronic Privacy Information Center show that the TSA, Department of Homeland Security and manufacturers of airport body scanners deliberately misled the public into believing the technology to be safe. It’s not. Just how dangerous are the scanners after all? So dangerous that TSA workers who simply sit near the body scanning x-ray machines have been falling victim to cancer, strokes and heart disease. In Boston alone, a group of TSA employees who were stationed around the body scanners is being called the Cancer Cluster after all developing cancer. The work of scientists from the Johns Hopkins School of Medicine was deliberately ignored after the group studied the health impacts of body scanners. The National Institute of Standards and Technology falsely claimed that Johns Hopkins validated the safety of the machines when in fact, scientists found that radiation levels emitted from the machines exceeded the General Public Dose Limit. A study conducted last year by Dr David Brenner, head of Columbia University’s center for radiological research, found that the body scanners are likely to lead to an increase in a common type of skin cancer called basal cell carcinoma, which affects the head and neck. Following the study, Brenner urged medical authorities to look at his work, pointing to the dangerous notion of mass scanning millions of people without proper oversight. Similar concerns to those explored in the Columbia University study were voiced in February 2010 by the influential Inter-Agency Committee on Radiation Safety, who warned in a report that the scanners increase the risk of cancer and birth defects and should not be used on pregnant women or children. The TSA is accused of not only deliberately misleading the general public, but of also denying the workers most at-risk for developing cancer from the machines accurate information on the dangers they face. Scanner operators were even denied the use of radiation measuring equipment while on the job even after colleagues had developed cancer. 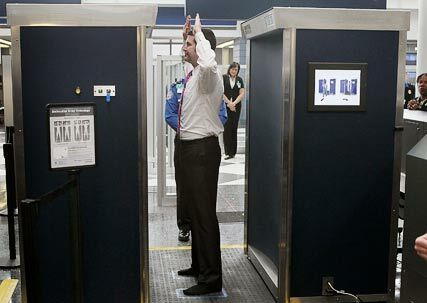 The entire body scanner scandal will go down as far more than an inconvenience to travelers. Rather, a class action lawsuit against the TSA and the “self-inspecting” manufacturers on behalf of cancer victims who operated the machines is assumed to be on the way. In the meantime, OPT THE F*CK OUT. Seriously. UPDATE: After publishing this article, we received an email from Gail Porter, the Director of Public Affairs for the National Institute of Standards and Technology: “The National Institute of Standards and Technology has made no statements or claims about the work of Johns Hopkins in evaluating the safety or measurement of radiation levels from x-ray backscatter machines intended for use in airports. Both NIST researchers and John Hopkins researchers have collected data on the amount and spatial distribution of X-ray radiation emitted by advanced imaging technology units deployed or planned for deployment by the Transportation Security Administration.